Just got back from visiting my brand new nephew! Four weeks old today. He’s *adorable*. I can’t wait to see my sister’s family again (which won’t be until sometime next year now). 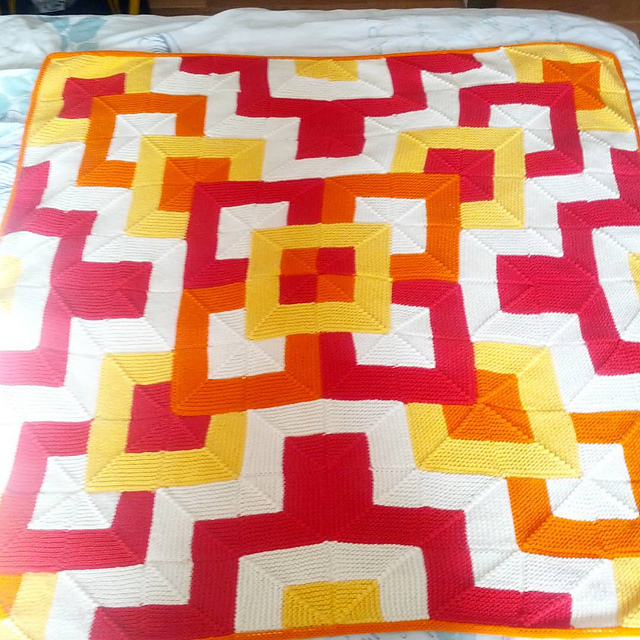 And I managed to finish his blanket in time too! I kinda wanted to keep it, but I can always knit one for myself if I really want one. Probably in different colours, since while I love red, the yellows and oranges aren’t really me. Now that the blanket is done and my wedding shawl is done, I’ve got nothing on the needles. Nada. Feels a bit odd. I can’t quite seem to decide what I want to knit next. A hat maybe? While I’m ruminating on that, I’ve brought out my spindle again. Yep, after about a year of not spinning at all, I’ve gone back to the white and blue BFL top I received as a Wildcraft fibre club shipment way back in 2010. I’m really enjoying it. I don’t know why I always put my spinning away for about half a year before spinning a little bit more. It’s all spun up now, all that’s left is plying. No promises on what that’ll actually get done, since I know from experience that I put down my spinning to easily when a new pattern catches my eye (or my imagination and I have to design it myself to get it out of my system). The last few weeks have been full of good mail days. 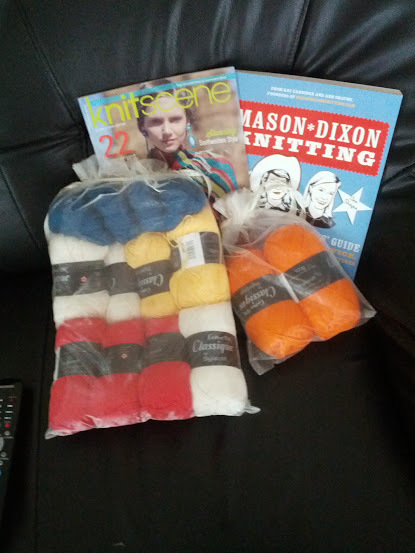 The latest Knitscene arrived first, then came the Mason-Dixon knitting book (a bargain at just £6 including shipping), and then… yarn! That’s the yarn for my little nephew’s blanket, plus an extra skein of lace for me. 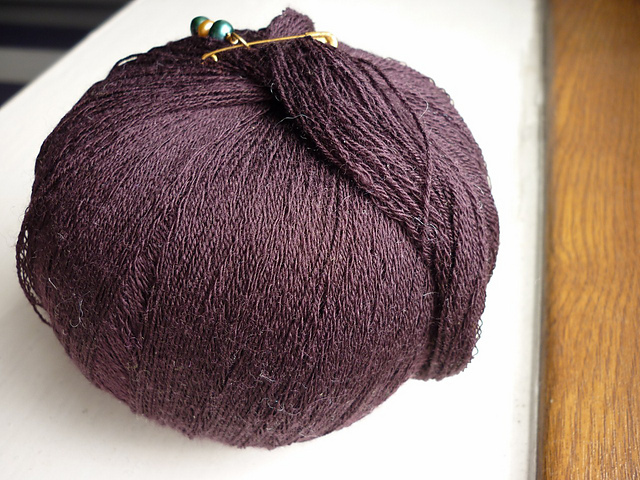 Funny thing, as I was entering the details of the lace into my stash, I realised that I already had a skein of laceweight from the same dyer in the same colour. Different base, but still! Apparently I really like teal. 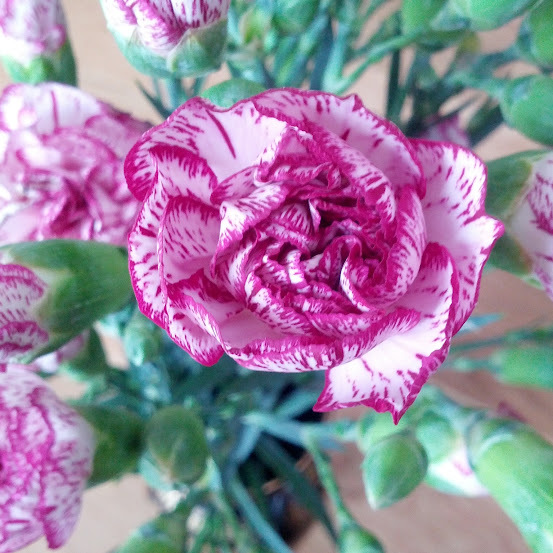 It’s not one of my “safe” colours that I usually go for (pinks and reds, for the those who haven’t known me for long), so I don’t know what it is that drew me to it. I’m sure you could guess from the above paragraph, one of my many sisters is pregnant! And obviously I’m going to knit for the baby. The blanket, which I’ve started tonight, is the Tamarix Quilt by Heather Zoppetti. I’d mentally queued the blanket when the magazine first came out, so when I received the issue of Interweave Knits (Fall 2010) for free from a fellow knitter in London I was thrilled to bits. I love Heather’s work. I’ve knit at least 5 pairs of socks by her so far and I’ve got at least one of her sweaters in my queue too. I also came up with another idea for her kids. When she’s too tired or doesn’t have time or whatever, she can play the boys a recording of me reading to them. Since I can’t actually see them as often as I’d like, at least they can hear me. And hopefully learn Finnish at the same time. I did a test recording tonight (just read a few paragraphs from Little House in the Big Woods) to see if it would work before suggesting it to my sister. Sounded fine to me, just need to find books where turning the pages won’t make too much noise. And as a bonus, it turns out that I don’t hate hearing my own voice! I used to really dislike it, but I’m okay with it now. Just like I used to hate photographs of me, now I don’t. So the plan now is for us to pick out a book or two when we’re both in Finland for our youngest sister’s graduation. How I’ll find the time to do it in between all of the wedding sheningans remains a mystery. Speaking of wedding shenanigans, I’ve started my dress. Finally. I’ve cut out and sewn the bodice pieces together. So far so good. I keep looking at the skirt pieces and placing them on the lace and pinning and then unpinning and rearranging and so on and so forth. I’m such a chicken when it comes to cutting. If something doesn’t work in knitting, that’s okay, I can always rip it out and start over without wasting anything (unless it’s mohair, learned that the hard way). But when you cut fabric, that’s it. There are no do-overs in the same sense. I’m still hoping to get the main bits of the dress all sewn up and ready by the end of the month though. Then I’ll take it to Finland with me and get my grandma to help me do the tweaks for it (she used to sew her own clothes). That’s the plan. Here’s hoping I stick to it. Last week has been gorgeous, weather-wise at least. 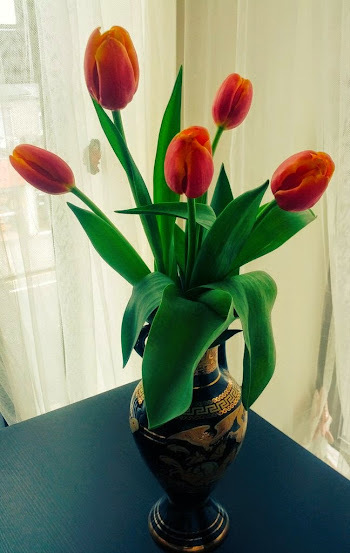 The one grey day before all of the glorious sunshine, I bought some tulips on an impulse to try to cheer up the flat a bit. They lasted about a week, so I’d say it was a well spent £2.50. Another sign of spring being here, for me anyway, is how colourful my recent meals have been. 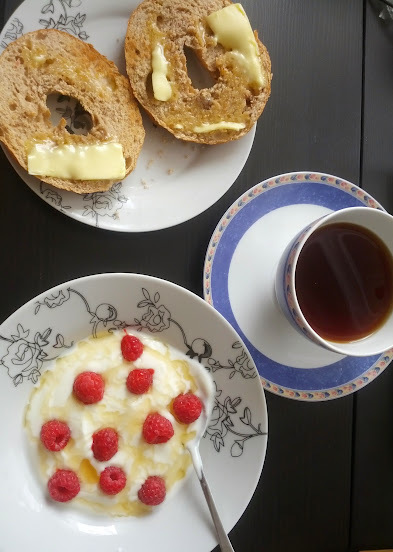 First there was my lunch, where raspberries added a great pop of colour to my honey & yoghurt. 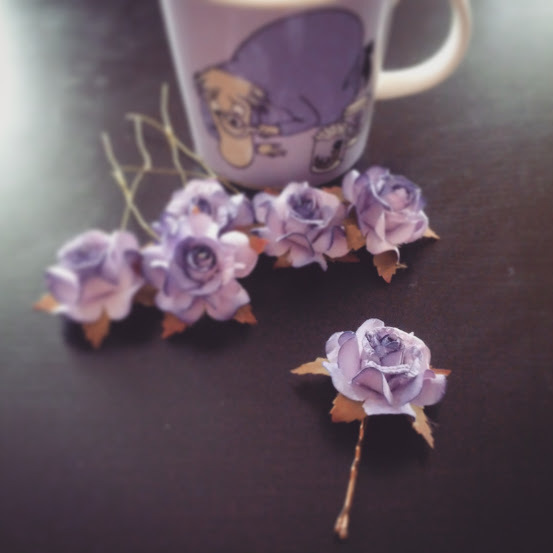 The teacup and saucer are a bit of an anomaly from what I usually choose colour-wise. But I love them. I think it’s because the cup is a lot more delicate than my usual mugs (which means I can’t haphazardly set down the cup without looking), so it forces me to slow down and actually focus on the beverage in the cup. It’s the kind of cup that I drink fro m when pretending to be sitting outside on a balcony in sunshine and reading a book. The big sturdy mugs are for curling up on the sofa under a blanket with rain coming down outside. 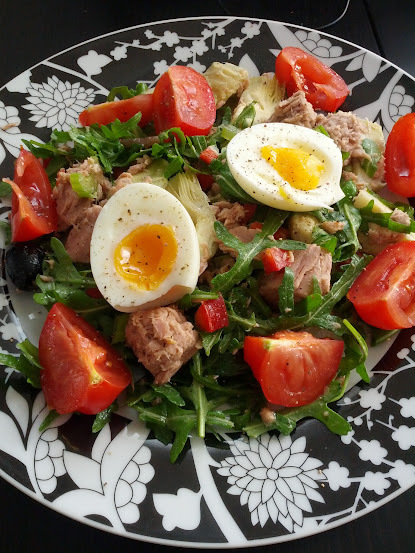 The other splash of colour came in the form of a salade Nicoise, recipe from The Skinny French Kitchen by Harry Eastwood. I love this book, it has so many great recipes in there. The practice dresses are both almost complete now. Only a few bits of hand-sewing left to do on both. The first one needs some adjusting of the seams right under the bust. And I’m probably going to shorted the sleeves a fair amount. Right now they’re full-length, but considering the rest of the dress, shorter sleeves would work a lot better. The second dress just has a few seams that can’t be sewn by machine. The neckline is currently a round neck and it looks fine. I’m going to wear it once, just to see how I cope with it being that high, then decide whether I want to change it to be slightly lower or leave it as is. As for knitting, well, it’s slow going on all fronts. I haven’t touched the socks that are meant for my dad in weeks. N&M’s wedding blanket has had a bit of progress. I now just need to knit the border and weave in the ends. Not a quick thing to accomplish. 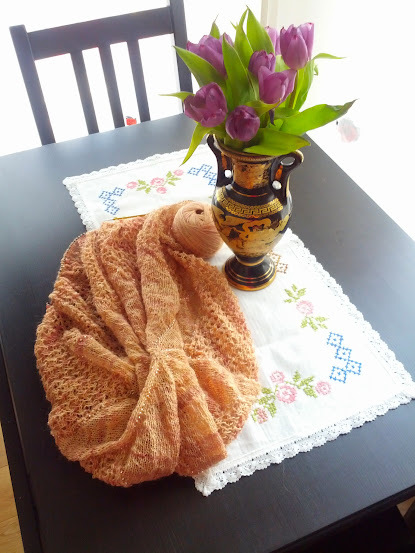 Most of my knitting focus has been on my wedding shawl. Haven’t managed to get to the point where I can start the next section’s chart, but that’s understandable. It’s now over 450 sts per round and the next section won’t start until I’m at over 600 sts. Amazon Prime has been keeping me company while I knit away on it. I keep alternating between episodes of Community, Devious Maids and Nashville. As well as Friends if I feel like I really to concentrate. A whole lotta TV in my life right now. But I am making time to go out running every once in a while, so that balances out my couch potato ways at least a little bit.